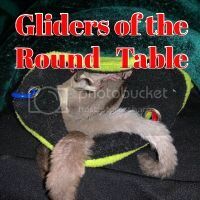 Register Log In GliderCENTRAL Forums Housing & Accessories Cage cover or no? How important is a cage cover, other than keeping food and poo inside the cage? Their nests and fleece pieces keep them in the dark during the day. It gets meddlesome when they are out and climbing on the cages and I can't see them because they are under the cover. Is it a must? Also I am in a warm climate and drafts / temperature not a problem. I've never used one, but I was just thinking as I was cleaning the wall today that I really should get one. To answer your question, I've never heard that they're a must have for any other reason. I believe for the most part cage covers are used to keep surrounding walls clean, and perhaps for drafty situations for some. If you don't feel you need or want a cover, than do not use one, I'm sure there are several who do not use any. You can just hang some fleece on the wall behind the cage to keep the wall clean. I put a sheet of plexiglass on the wall behind my 3 cages - it is a lot easier to wipe clean than scrubbing food off the painted wall.